Arizona Fence Experts saw the need for an alternative material when crafting metal fences. The traditional standard for metal fencing is wrought iron, but is not a cost effective material. Wrought iron or as we like to call it “rot iron” often chips making it susceptible to rusting. This required the fencing to often be painted or replaced costing both time and money. The crafting of wrought iron is also more expensive than aluminum making common repairs very costly. 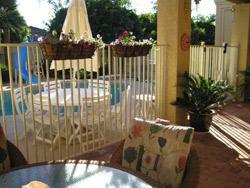 Aluminum fencing is manufactured rather than fabricated like wrought iron making it much more cost effective. Aluminum is not susceptible to rust like iron, and does not require constant painting. Aluminum can be crafted in a variety of styles to match with any landscape. Unlike wood and chain fencing that can be easily scaled or cut, aluminum can be spiked on top adding extra security. Aluminum fence panels can be racked. Meaning that if you live on uneven land they can be adjusted to meet the slope. Since they are placed in panel sections of aluminum fencing, they are easy and inexpensive to replace. If you’ve determined that aluminum fencing is right for you or need repairs to your existing aluminum fencing, then make sure you get the highest quality fencing service in Phoenix, Arizona. For the past 13 years Arizona Fence Experts has been providing the valley with exceptional aluminum fencing service and remain a local, family owned company. 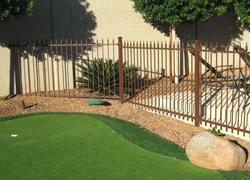 We want to make sure that you get the best possible fencing service that Arizona has to offer.